Sixth Grade English Language Arts (ELA) focuses on developing student’s reading and writing skills. Through reading novels, articles, and poetry students will learn how to analyze, compare/contrast, and evaluate the texts. Students will begin the year reading Wonder, a collaborative book analysis for sixth and seventh grades. Students will then continue reading Percy Jackson and the Lightning Thief, Number the Stars, Tuck Everlasting, A World Without Fish, and poetry. Students will engage in reading complementary articles and stories with each primary text and will relate discussions to historical or scientific units of study. In our English study, students will use the Prentice Hall Grammar and Writing (2008) textbook. They will write literary analyses, as well as, narrative, persuasive, and informative essays. Through the writing process students will also develop grammar skills to become better writers. World History explores the history of the world from Early Humans and Societies to the modern World. Emphasis on the culture, geography, and history of civilizations is stressed. Social studies skills such as map reading, uses of primary and secondary sources, and writing are emphasized. Interactive resources, biography, and videos are components of the series used. Text: Holt McDougal "World History" 2012 ed. Extensive online material through the History Channel is part of the text as well. Welcome to Middle School!!! The 6th graders will apply their elementary skills to connect ratios and rates to whole number multiplication, division and word problems; using the Sadlier Oxford Progress in Mathematics (2014) series to support their learning. They will understand division of fractions and extend this notion to the system of rational numbers (fractions, decimals and negative numbers). Students will write, interpret expressions and equations and apply this concept to real world situations. Students will develop an understanding to statistical and critical thinking through multiple graph and media displays. Throughout the school year, students will challenge their math skills through weekly essentials. Multiple problems that make students review their skills and think outside the box...outside the traditional curriculum. Sixth Grade religion focuses on the Old Testament to increase the students' knowledge of salvation history as it is revealed in Sacred Scripture. Students will follow the unit of study provided by the Christ Our Life (2016) text. The goal of the class is to help students grow in love for God through a deeper understanding of God's plan of salvation through a greater understanding and appreciation of Old Testament. We will follow integrated science in sixth grade, using the ﻿iScience ﻿(2016) series by McGraw Hill. Students will learn about matter, technology skills, astronomy, ecology, and physical science. I will use interactive notebook. Students will learn note taking skills, reasoning, critical thinking skills, typing lab reports, and team work. Students are expected to come prepared to class for review quiz every day. Students will take a chapter test at the end of each chapter followed by hands on lab activity. Students will have a major STREAM project this year. Sixth grade curriculum is truly spectacular and ignites curiosity in young minds. We are so excited for this Sixth Grade year and to have many new smiling faces in the Middle School! This year there are many exciting things to look forward to; such as our Betsy-Jeff Penn (4H) field trip, lockers, changing classes, and everyday classroom fun! 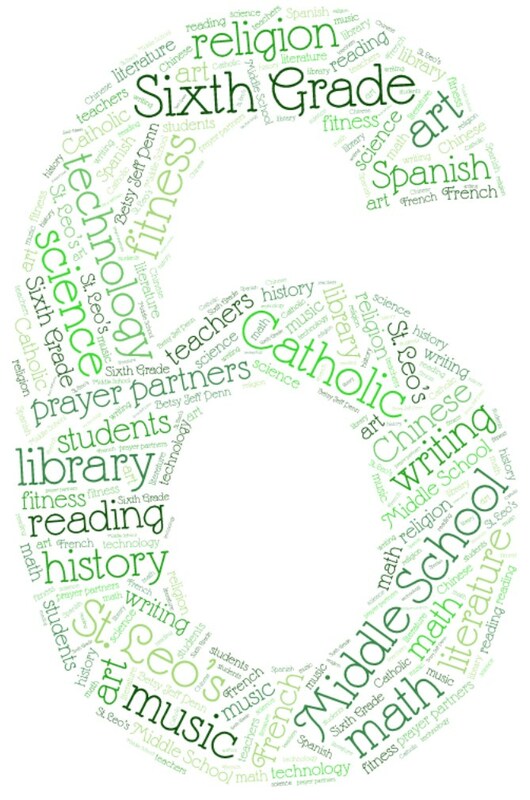 Navigate this page to learn more about each of the sixth grade classes.